Find My Workspace lists over 95% of the business centres market in Mortimer. Simply click Request Quote to check pricing for one office, or Add to Basket for multiple offices. Recently painted office space for five+ people with board room and seating areas. Comes with parking, shared w.c and well-equipped kitchen which includes a fridge, microwave, toaster, crockery and utensils. Utility bills and rates included in the price. 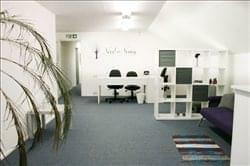 The office comes unfurnished with newly painted white walls and blue hard-wearing carpet. The office has its own front door and is private.